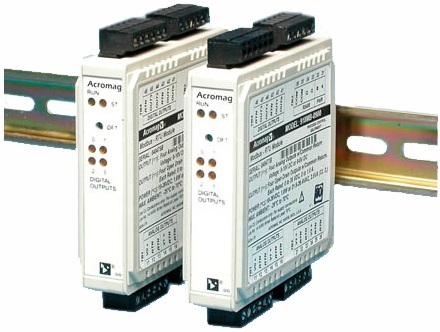 This signal conditioner is a two-channel analog input module with discrete outputs and Modbus communication. It conditions periodic or pulse wave form inputs and provides solid-state relays for limit alarms or ON/OFF control. – 10µS (frequency input); 5mS (pulse input). (5mS ON and 5mS OFF for 10mS period or 100Hz). – -3dB at 35kHz, typical. Software selectable 2.7K ohm input pullup to +5V and a 1K ohm input pulldown to return. The resistors may also be left floating (none). 0 to 1.375 seconds, configurable in 5mS increments. Common mode: 80dB @ 60Hz, typical with 100 ohm input unbalance. – 0 to 48V DC, 1A DC. - LEDs indicate power, status, and discrete level/alarm. – 10 to 36V DC. – 4-way isolation between input, network, power and discrete I/O circuits. Inputs are isolated channel-to channel for common mode voltage to ±5V DC. USB-to-RS232 adapter. See page 70 for more info.